Sunrider’s basic herbal food staple. NuPlus® is a nutritionally dense herbal food that contains 60-65 calories depending on flavour, 0 fiber, and 3 grams of protein per serving. NuPlus® comes in five delicious flavours: Pina Banana, Mixed Berry, Apple Cinnamon, Simply Herbs, and Original. Simply Herbs and Original NuPlus® both consist of 100% complex carbohydrates and Original NuPlus® is formulated with no beans. The NuPlus® fruit flavours consist of 91% complex carbohydrates and 9% simple carbohydrates. NuPlus® makes a very nutritious addition to breakfast, can be consumed as a mid-meal snack or before and after a workout. As well as being very satisfying, NuPlus® helps curb cravings for unhealthy foods and is very easy to digest. 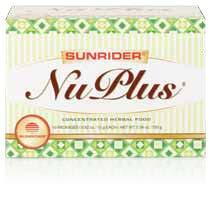 NuPlus® is sold in 10 and 60 pack boxes of 15 gram servings. Ingredients for Pina Banana Nuplus: Coix Lacryma – Jobi Seed, Soybean Seed, Chinese Yam Root, Euryale Ferox (Fox Nut) Seed, Nelumbo Nucifera (Lotus) Seed, Nelumbo Nucifera (Lotus) Root, Pyrus Malus (Apple) Fruit, Lilium Brownii (Waterlily) Bulb, Phaseolus Vulgaris (Green Bean) Seed, Phaseolus Vulgaris (Red Bean) Seed, Phaseolus Vulgaris (Black Bean) Seed, Phaseolus Vulgaris (White Bean) Seed and Imperata Root, Banana Fruit and Pineapple Fruit. Sunrider’s other herbal food staple. VitaShake® is a nutritionally dense herbal food that is similar to NuPlus® except VitaShake® contains added vitamins and minerals, a pre-biotic for intestinal health, 95 calories, 3 grams of fibre, and 4 grams of protein per serving. VitaShake® comes in two flavours- Chocolate and Strawberry and makes a very nutritious breakfast, can be consumed as a mid-meal snack or before and after a workout. As well as being very satisfying, VitaShake® helps curb cravings for unhealthy foods and is very easy to digest. 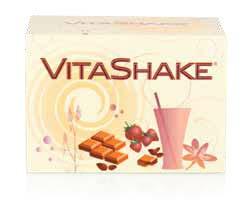 VitaShake® is sold in 10 pack boxes of 25 gram servings. Ingredients for Chocolate VitaShake®: Coix Lacryma-Jobi Seed, Fructose, Soy Protein, Alkali Processed Cocoa Powder, Fructooligosaccharides, Natural Flavour, Chinese Yam, Fox Nut Seed, Maltodextrin, Lotus Seed, Lotus Root, Water Lily Bulb, Potassium Phosphate, Calcium Phosphate, Imperata Root, Magnesium Oxide, Stearic Acid, Carrageenan, Calcium Carbonate, Soy Lecithin, Xanthan Gum, Manganese, Niacinamide Ascorbate, Chromium, Fumarate, Molybdenum, Selenium, Vegatable Oil, Vitamin E, Zinc Oxide, Copper Gluconate, Calcium Pantothenate, Vitamin A, Vitamin B6, Thiamin, Riboflavin, Folic Acid, Biotin, Iodine, Vitamin K, Vitamin D, and Vitamin B12. A very nutritious, easy to digest meal replacement bar, it consists of 3 grams of fibre, 6-7 grams of protein, depending on the flavor, 3 grams of fat, 2 grams of sugar, and contains 120 calories per 30-gram bar. Sunbars® come in 3 delicious flavors; Fruit, Chocolate, and Oatmeal Raisin. Eat 1-2 per day (or more) at meal times or as an in-between meal snack; also fabulous before or after exercise. Drink a cup of Fortune Delight or water with each bar. Ingredients: Soy Protein Nuggets, Apple Juice, Psyllium, Bananas, Mangos, Pineapple juice, Strawberry Powder, Almonds, Honey, Lycii fruit, Chinese Asparagus Root, Coix fruit, Soybean oil and Wheat Germ oil. There are many reasons our body systems become imbalanced or weak, including diet, genetics and stress. Quinary® is a Sunrider product consisting of 43 herbal foods that are formulated to help balance and strengthen your five main body systems. Quinary® can be purchased as a complete product that nourishes the five systems of the body, or as five separate formulas, each supporting one of the five systems. When the five formulas are consumed together the results are the greatest, as your five systems communicate and depend on the strength of one another. Dr. Chen explains it like this: If you had a team of five horses with one horse being weak, you would nourish all five horses plus give the weak horse a little extra support. Most people consume the Quinary® formula and supplement with the separate Quinary® formulas as needed. Quinary® is sold in 100 capsule bottles, as are the individual Quinary® formulas. Quinary® can also be purchased in boxes of ten or sixty 3-gram packages. Most consumers purchase the capsules to begin with. Start by taking 3-4 capsules each morning before breakfast. Any less is a child’s dose. You can open up the capsules if you wish and drink as a tea with hot water and 3-4 drops of Suncare or Sunectar. If you purchase the powder, there are 10 capsules worth of powder in each envelope, so adjust accordingly. Take as much as you want and any time you feel your body needs extra support. Ingredients: Chinese White Flower, Scutellaria Herb, Dandelion Root, Gou Teng, Licorice Root, Tora Seed, Mint Herb, Paris Herb, Fennel Seed, Cinnamon Bark, Poria (Mushroom Powder), Chinese Yam, Ginger Root, Sophora Flower, Barrenwort Herb, Chuan Xiong Root, Mongoliavine Root, Fang Feng Root, Ginseng Root, Honeysuckle Flower (Silver Flower), Yeuan Wu Root, Chrysanthemum Flower, Dipsacus Root, Angelica Root, Alpina Ginger Root, Angelica Centis Root, Leek Seed, Balloon Flower Root, Bamboo Leaf, Dwarf Lilyturf Root, Papermulberry Seed, Senega Root, Imperate Root, Forty-Knot Root, Reed Root, Rhubarb Root, Broomrape Herb, Chinese Catnip, Asias Herb, Bai-zhu Root, Eucommia Bark, and Morinda Root.